I believe those involved with cystic fibrosis, whether as patients, parents, family or friends, fight a battle of epic proportions. It’s a battle so complex and grueling that those outside of its grasp have a hard time understanding the horrors of the disease. But every hero needs an enemy and this disease has produced thousands of heroes – heroes of the same caliber as any known to man and storybook. I believe in these heroes who battle, those who have passed, and all of their stories. I will do my best to help them fight the fight through humor and words. Now appearing for three shows daily . . .
I’m in my late forties and have cystic fibrosis. I’m married with a very brave wife and a cf-free daughter. I worry all the time about losing my insurance because without it, well, that would be a big problem at this age. So, I keep my identity hidden. Unknown Cystic is a nod to a very funny comedian, the Unknown Comic, who I enjoyed watching on the Gong Show many years ago. Plus, if you must know, I look better with a bag over my head. CF and age have taken their toll. Thank you for visiting my blog. I really appreciate it and wish you the best in life. I have read your blog for months. I find it just perfect. I love it. I love your humor. I love your wife. I love your daughter. I love your perspective. I am a CF wife. Husband Chris is 33, dx at birth, DDF508. We’ve been married for nearly 12 years (knock on wood) and have a 2 1/2 year old daughter through in vitro. Chris is getting sicker by the year, sometimes it feels like by the month, but he is here. Every day he is here is a victory day. Then other days I think well, of course, he is here… he’ll be here for another ten years. And then the blood comes back, or he can’t move from the pain, and I’m like oh yeah, I f’ing hate this disease. Anyways, just wanted you to know that your love, wit, sarcasm and joy are truly a bright spot to read among a sea of CF blogs. So thanks. Did I mention I love your blog? I have reread the posts about your daughter and your letters to her multiple times and they never cease to make me cry. Buckets of tears. She is lucky to have you. Just like I feel our daughter is so lucky to have Chris. Best of health to you. No more blood. And a zillion more days of laughter and joy with your girls. I’m truly touched by your comment and thankful that you chose to take the time to leave these kind words for me. They mean a lot. I’m happy for you and Chris that you have a 2 1/2 year old daughter. That’s great news. I am sad that Chris is getting sicker by the year, or month, as you write. I hope he has a good doctor and clinic and am wishing him the best, but I know the realities of this disease. I wish I had a time machine and could go back to when our daughter was 2 1/2. That was a great age. It goes by so fast, which isn’t fair. We should be able to slow time down. I will do my best to continue to write posts that live up to your praise. I too have CF.. & my own blog which sometimes addresses issues surrounding CF (how could it not?). I like your perspective & wish you good health! Thanks for introducing yourself. I subscribed to your blog. I really like it. Good health to you, too, and I hope to hear from you again in the future. My name is Michelle and I’m 19 with CF. I have have a tattoo that says “I do not fear the unknown. I am the unknown. Unknown cystic.” This inspires me everyday. I had no idea who came up with the “Unknown Cystic” idea until I joined twitter and started following you, today. I look forward to reading more of your blog. It’s very inspiring, witty, and I love it! Thank you for giving me words to live by! Well, this is one of the most unique comments I’ve ever received. Did you really get a tattoo with that saying on it? Very cool. You’re my hero for that. I don’t remember if I wrote that phrase or my friend Josh did. I’d have go back and check. I have to remember what post that was from. Thank you for the kind words. I appreciate them very much and am glad you enjoy the blog. I’ve been lazy lately and haven’t posted much. This damn Game of Thrones series is sucking up my time. I hope you’re doing well at 19 with CF. Stay in touch. If you have picture of the tattoo, I’d love to post it on the blog. Yes it’s on my lower back. It’s faded pretty bad but I’m going to get it touched up soon and as soon as I do I will send you a picture! I do okay with my CF, I’m in the hospital about once a month. My lungs like to collapse but haven’t for awhile. I have other problems too, but I try to keep my head up and am working hard to fight this disease harder. I just got out of the hospital today actually. Overall, I do fine with it! I hope you’re doing okay, you really are an inspiration! I’m not sure which I like less, collapsed lungs or hemoptysis. It’s a toss up. I guess I hate collapsed lungs more because of the chest tube I had to get. Glad you’re fighting it hard. I know there’s a drug on the horizon that will give us the help we need. Just found you via Cindy’s cf bloglist. Will show my 17 year old son (DD598) in the morning. He’s about to graduate from high school and is thinking about the future. We have 7 kids; eldest and youngest (newborn) have CF; other 5 are carriers. Glad to “meet” you! I’m so happy you found me and Cindy placed me on the blog list. 17 was a rough age for me. 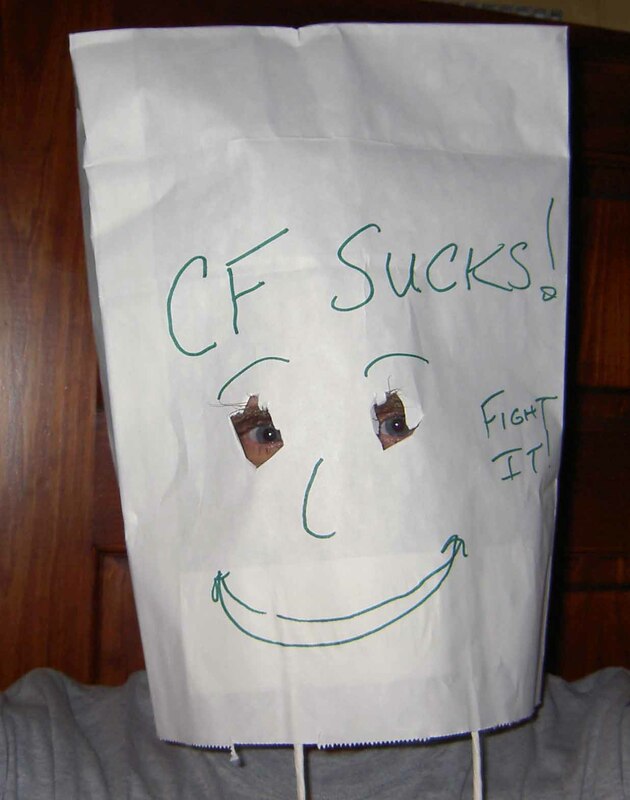 Back then there were few older CFers and no internet to find them; the future seemed bleak. Happy your son is growing up now. Lots of hope. More than ever. Sounds like you have your hands full with your family. We have one daughter and she’s all we can handle. For some reason I had never clicked on this link and seen this page (who walks around the world with blinkers on then??) Anyway, I just did today and read your page and all the comments on it. I hope one day you and your wife and I and my husband meet, and your daughter and my son play together, and we laugh and drink and toast to the future, because that’s the kind of world I want to live in. I just wrote a most excellent comment to you and WordPress for the iPad just ate it. ARGH. Not fair. I’ll try and recreate the magic. First, thank you for the kind words, I’m humbled. A bit of a lump in the throat too. I’ve had the thought too that it would be nice if our families met. I dig that idea. If I could fly, I’d visit you and my warped friends in England. It does bother me that I can’t right now. But who knows in the future. At the very least, perhaps one day, my wife and daughter might fly down under and you could show them a heard of crazed kangaroos or any creature down there that doesn’t have a poisonous bite. Even before I met you, I thought it would be nice to live in AUS. I’m a bit tired of what this country has become at times. And I have now doubt I’ll turn on my faucet one day and flames will come out because of the fracking rights someone sold in my area. I hope AUS is doing a better job with the environment than we are. Again, thank you for the compliments and understanding. 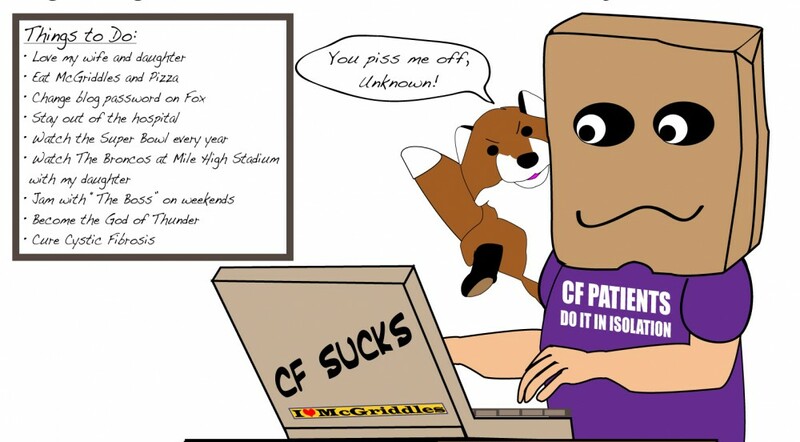 I stumbled upon your blog, whilst deliriously searching the interwebs for info about CF. My 21 month old son is soon to be sweat tested, and while I feel mostly confident that he does not have CF, I am equally certain that he does. Trying to prepare myself and getting terribly sad along the way. What are the odds of this: my husband is a Pulmonologist who just happens to run the CF clinic at our local medical center. Anyhoo…regardless of our situation, and whether or not we become a part of the ‘ CF Family’, I have really, thoroughly enjoyed reading your blog. I’m a blogger myself. I’m so happy you stumbled on my blog. I’m lucky that you did – and you left a comment. Double bonus. Obviously, I hope the sweat test is negative. However, if it isn’t, there is more hope for fighting this disease than ever before. More knowledge. Better doctors, nurses and clinics. And as your husband is a Dr. at a CF clinic, I would bet on your son having the best of support and a great life. Crossing my fingers for the best outcome possible. BTW, I will check out your blog. Thank you for visiting and leaving the comment. I’m hoping your blog discusses your son and the upcoming results.